by Fred Aprim, author and historian. California, USA. April 19, 2004. Baghdeda or Baghdede is a village in northern Iraq, 38 miles southeast of Mosul. There are many theories about the origination of the name Baghdeda beside the fact that it is pronounced and written in many forms. The strongest theory states that the name is from the Assyrian Akkadian "Bakdedo" (youth's home), later known by the Aramaic name "Beth Kdhudhe," which means the same as that of the Assyrian Akkadian. The name changed during the Sassanid Persian rule to "Baghdeda" (Persian "God's giving": Bagh or Beg is God or patron and Da is to give or giving). It was also pronounced as Khudedid or Beth Khudedid. In other times, Beth is shortened to "Ba", thus Ba-khudeda. In the 13th century, Ba-khudeda was used by Arab writers like Yaqut (Mu'ajam al-Buldan) in which he defines it as: "a village but as large as a town, situated in Nineveh, east of Mosul, whose majority of people are Christians." Another old Aramaic name "Beth Deda" (the humble's home) has been found to reflect Baghdeda in three different 17th century manuscripts. During the Ottoman Turks rule, the Turkish name Qara Qosh (black bird) came into use. Finally, and as part of the Arabization policy campaign, the Iraqi government changed the village name to Hamdaniya, named after the Arab tribe of Banu Hamdan, who has settled in the district. The Assyrians of Baghdeda became Christians during early Christianity. With the Christological disputes of the 4th century, they followed the Nestorian teaching but switched to the Jacobite (Orthodox Assyrian) rite through Shapur al-Baghdedi in the 7th century. Worth mentioning that Bartilla was Nestorian village as well; however, the efforts of Bishop Gabriel al-Sinjari, in early 7th century, switched it to Jacobite as he held a special place at the Sassanid Persian royal court and King Khosrow (Khosru) II and his queen Sherin. Gabriel was a Jacobite; however, he switched to Nestorianism when he married a Nestorian woman. He then married two additional Magian wives that led to his excommunication by the Nestorian patriarch; thus, he joined the Jacobite Church for the second time. Gabriel was influential at the court of the king and his wife because he has cured the queen and she had a child after years of unsuccessful pregnancy. His influence was so great that he prevented the Nestorians from electing a patriarch for 20 years. Baghdeda's population is indigenous to the village; however, Assyrian Christians from other regions of northern Mesopotamia (Assyria) have moved to and settled in Baghdeda. 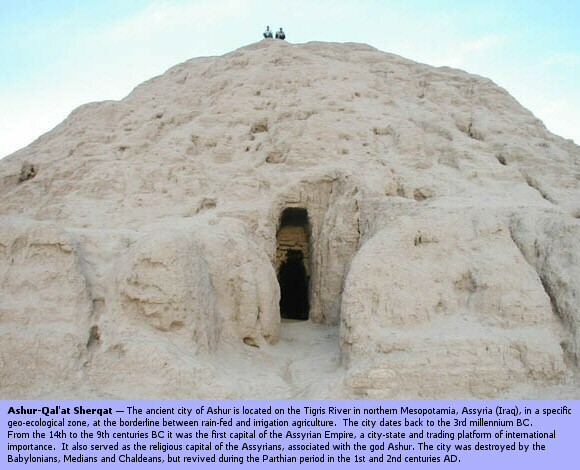 In A.D. 1089, for example, the Church of Mar Ahodama in Tikrit (built before 10th century) was looted and taxes on its Jacobite population became so unbearable that most of the Assyrian Christians left the city and the Jacobite Mapharian, Youhanna IV Saliba, followed suit and moved to Mosul. Of course, Mapharian is a title given around the 12th century to the head of the Jacobite Church in the east as the representative of the Antiochean patriarch. Many of these Tikriti Christians moved to Baghdeda and later few Mapharians settled in it as well. Still, the town would be a great anthropological study with many rooted family names such as Assu, Ashu, Annu, Ausu, Ballu, Battu, Tammu, Toolu, Daddu, Rammu, Ritu, Shinnu, Shammu, Shnatu, Samdu, Saifu, Kasbu, Kannu, Mattu, Miru, Nooru, Noodu, Garmu, Lasu, and many other names that reflect Assyrian Akkadian influence. In 1580, certain Jacobites of Baghdeda began to build relations with Rome through the Monastery of Mar Bihnam, but it was not until the 18th century that these Jacobites began to join the Vatican and became known as Syrian Catholics (Suryan Katholic). In fact, recently, the Dominicans celebrated 250 years of their presence in north of Iraq. There was much unrest between the new Catholics and the originally Jacobite Christians. It is reported that when a Catholic bishop Essa Mahfoodh went to see the Jacobite Patriarch Elias II Hindi al-Mosulli (1837 – 1847) in order to secure the division of properties between the two groups, he was received with insulting remarks. The patriarch told the Catholic bishop: "French (Papists), isn’t it enough that you divided my people in Mardin and now you come here to Mosul as well to do the same thing here?" Backed by the French, the bishop went to Mohammad pasha, the Turkish governor, and presented his complaint to him. In 1837, the properties (churches and monasteries), manuscripts, and furniture were divided in a special manner between the two Assyrian denominations. In early 18th century, the Persians invaded the Mosul region and most of the inhabitants of Baghdeda escaped to Mosul with all their valuables, in accordance to the governor's orders. Mosul was harassed and then sieged for months. However, the Christians defended it bravely and after months of blockade, the Persians finally signed a peace agreement with Mosul's governor Hasan Pasha al-Jalili, from the Nestorian Jalili family, and withdrew in A.D. 1743. To reward the Christians for their bravery, the Jalili governor permitted many churches in the Mosul region to be restored. Since the 17th century, churches in Baghdeda, such as "Mother of God" and "Mar Youhanna" had schools teaching math, science, language, and theology. Today, there are many churches in Baghdeda including the "Mother of God," "Mar Zina," "Mar Sarkis and Bakus," "Mart Shmoni and Her Seven Children," "Mar Giwargis," "Mar Youhanna," "Mar Yakoub or Mar Andrius," and "Mar Theodorus." The town has many monasteries as well, including "Mar Youhanna Dailamaya or Mqortaya," "Mar Qoryaqos," and "Mar Bihnam." Next, the governor sent his son to Constantinople (Istanbul) to meet with the Ottoman Sultan Mahmud I. The purpose for the visit was to ask the sultan for a reward for saving Mosul. The sultan issued an official firman in A.D. 1778 and paid Hussein Pasha al-Jalili 800 Qirsh to buy the village of Baghdeda. The people of Baghdeda were very upset because someone who did not own it had given their village away so easily. They met and decided after long deliberation to abandon the village. When al-Jalili heard the story, he felt guilty somehow and decided to return the ownership of the village to its rightful owners. He issued a decree in 27 Dhi al-Hijja, 1156 Hijjra (A.D. 1778) in which he relinquished his ownership to Baghdeda, however, he kept his rights to receive the tenth of its produce in taxes. This continued until Ayyoub al-Jalili headed the Jalili family. He tried to enforce the Sultan's original firman; however, the people of Qara Qosh, as it was known at this time, fought with the help of Bihnam Bounni, who won the case in Mosul courts in 1920 and traveled to Istanbul and won the case there in 1923. Nevertheless, Ayyoub al-Jalili and the Jalili family returned again and tried to claim ownership of Qara Qosh. On November 21, 1949, judge Moslih al-Den al-Salhani rewarded Qara Qosh to the Jalili family. The people of Qara Qosh applied a petition to the Iraqi government in which they explained the whole history of their village and ended the petition with permission to leave Iraq if the government did not return ownership of the village to them. The courts looked into the matter one last time and on March 15, 1954, rewarded the village to the rightful owners, i.e. the people of Qara Qosh. In their literature and writings, the Assyrians of Baghdeda remember vividly the raids of the Persians and Kurds on their village and churches. For example, in 1171, according to Abdal, while the governors of Mosul and Damascus were fighting each other, the Kurds used the opportunity and attacked Mar Mattai. According to Ibn al-'Abri (Bar Hebraeus), Fiey writes that in 1261, the Kurds came down to Mosul and killed many Christians who refused to follow Islam and looted their homes and churches. The Kurds then occupied the monastery of the Nuns (Deir al-Rahibat) and killed many of the nuns and many others who have sought refuge in the monastery. In A.D. 1288, and according to the 12th century Bar Hebraeus, a battle took place between the Kurds and Tatars near Baghdeda. With the end of the battle, the Kurds chose a dozen of the bravest and best looking young men from the village and killed them to show their strength and secure their presence around the region. 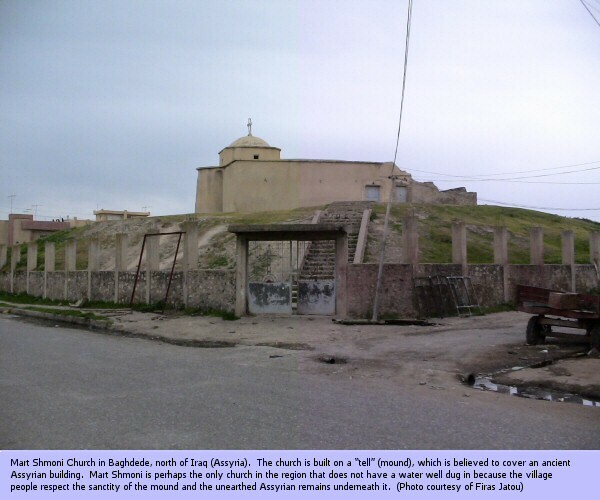 In A.D. 1324, Baghdeda is attacked by Kurds again and many homes and four churches were burnt. In (1742 – 1743) the Persians and Nadir Shah plundered and looted the whole region of Mosul wilayet, including many Christian villages. 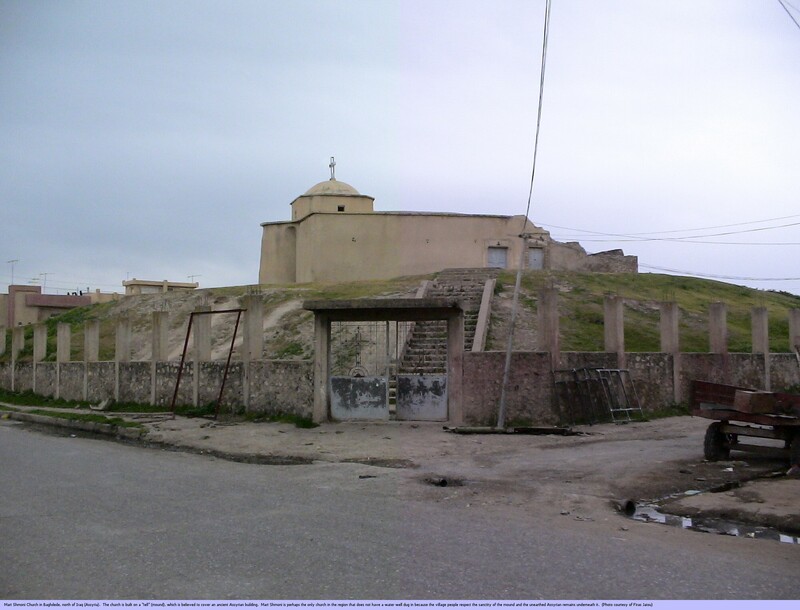 More recently, the Assyrian town of Baghdeda alone gave about 6000 martyrs during the Ba'ath regime's conflict with the Kurds, especially post Iraqi - Iranian war during what became known as " Anfal" operations of 1988. There is a lot of interest in the archaeology of Baghdeda (Qara Qosh) today. It has many Assyrian archaeological remains, like those of tell (mound) Bashmoni (Beth Shmoni), tell Mqortaya, tell Karamles, tell Mar Bihnam and others. These mounds must be fortresses, temples, or buildings that belonged to the Assyrian capital of Kalhu (Nimrod). Throughout 1922, 1927, and 1935, excavators found gold pieces, cylinder seals, and they found an Assyrian statue in a well in the church of Mar Zina, which is displayed in Mosul Museum. In 1942, an Assyrian bathroom and several graves were found near the church of Bashmoni. Furthermore, during the 1980s excavations in the grounds of the Church of Mar Youhanna (Saint John), archaeologists found human remains inside graves in the eastern side and at a depth of one and a half meters. These graves were built with typical Assyrian large sized rectangular shaped bricks. Additionally, references to Athur (Assyria) continued in texts from Baghdeda. Mapharian Athanasius Ibrahim II of Tur Abdin visited Tikrit, Baghdad, and Arbil to attend to his congregation. According to Afram Abdal al-Khouri and his book "al-Lu'lu' al-Nadheed fi Tareekh Deir Mar Bihnam al-Shaheed (The Layers of Pearls in the History of the Monastery of Martyred Mar Bihnam), 1951, p. 219, Sony writes: "in 1365, the mapharian came to Athur or Mosul and was welcomed by Nour al-Din the Chief of Baghdeda …" (Sony 1998, 699). Lastly but not least, according to Mar Bihnam monastery archives, Sony writes that in 1294 – 1295, a certain king "came to Lower Athur, the city of Saint Mar Bihnam …" (Sony 1998, 95). Furthermore, the modern town of Baghdeda is being used as a basis for the Virtual Ancient Mesopotamia simulation. This town has roughly 3,700 agricultural fields cultivated by 1,000 households. Working with the University of Chicago's Oriental Institute, John Christiansen is using a complex adaptive systems approach to create an ancient Mesopotamian village circa 2,500 B.C. Mesopotamia, the land that was between the Tigris and the Euphrates rivers, relied on irrigation to grow crops. However, the irrigation eventually turned the soil toxic making it unable to support crops. Eventually the civilization disappeared leaving information – including that of the poisoned fields – on cuneiform tablets. Although agriculture is an important part of the Baghdedis, the town is famous too for its herbal and root based medicine, in addition to wool and leather making, carpentry, and metal crafting. Jewelry is popular always since antiquity, just as in many other villages in Iraq, as it is witnessed in many of the remaining monastic and church items. Additionally, archaeologist Mr. Abd al-Salam Sim'aan al-Khdedi has completed finally a study about the historical background of the village of Baghdeda. He is a graduate of the College of Literature, Archaeology Dept. in Mosul University 1973. Al-Khdedi has been working for the Iraqi archaeological dept. since 1975. In different capacities, he worked with many international groups throughout many sites in Iraq. He worked with Prof. McGuire Jason (University of Chicago) and then Prof. Robert Adams; Prof. Baez (German excavation team); Dr. John Nicholas (British School); Dr. Helka (Austrian team); Dr. Charles Bernie (Manchester University); with other teams from British, German, Polish, and Italian backgrounds; and lastly but not least with the expedition of the British Museum under Prof. John Curtis. Al-Khdedi worked with many Iraqi groups as well, again, in one capacity or another, in many locations at Hatra, Ashur, Ur, Aski Mosul, kharbat Zakaria in Baghdeda, and others. Dr. Fr. Bihnam Sony. Baghdede: In the Syriac, Garshuni, and Arabic Texts from the Beginning of the 7th Century to the End of 19th Century. Rome: 1998. Bar Hebraius. Syriac Civic History. Arabic edition. Habib Hanona. The Church of the East in the Nineveh Plain. 1992. Geoffrey Khan. The Neo-Aramaic Dialect of Qaraqosh. Brill Academic Publishers (October, 2002). An-Nahar Newspaper, Issue October 1, 2002. Lebanon.